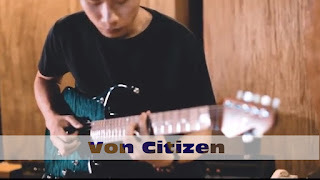 Sentience is the debut album of Von Citizen. Olly Steele from MONUMENTS is not only kind enough to come up with such amazing tunes but also filmed the playthrough for the guest solo, so we decided that Mechanic to be our first choice for the next playthrough with no doubt. Featuring our sweet axes Aristides 060, 070 and Ernie Ball Musicman JP15. Von Citizen is a Progressive Metal band from Guangzhou, China. Formed by Nye, Fish, Ming, Xingxing and Flin in late 2012.